Ever since I arrived in the USA, I've been keeping my eyes and ears open for interesting connections between Paris and Boston. I've found some historic ones, a couple of artistic ones, and now a culinary one. No, it's not a fancy French restaurant with a chef who went to le Cordon Bleu Culinary School, it's the falafal sandwich served at the Clover food truck at the Massachusetts Institute of Technology (MIT). Now, while most people may shudder when they think of the food served on college campuses, I had heard that the lunch trucks at MIT are a great option for a fast meal and was willing to give one of them a try. After perusing my options, I picked the truck that had a group of people gathered around it even though it was well past lunch time and ordered a BBQ Seiten sandwich with rosemary french fries. While waiting for the fresh potatoes to be fried, I started chatting with the crew of friendly women who work at Clover. When I mentioned that I live in Paris, one of them told me that their chick pea fritter sandwich was influenced by the most famous falafal in Paris, l'As du Falafal. Starting to regret that I had already ordered a BBQ sandwich, she promised to tell me when another customer's falafal sandwich was ready so that I could see how it compares with those in Paris. Even though I didn't get a chance to sample it, the falafal sandwich definitely resembles its Parisian counterpart, albeit a slightly skinnier version of the overstuffed one in Paris. And how were my freshly prepared rosemary french fries? Absolutely delicious - the crisply fried rosemary was the perfect addition! 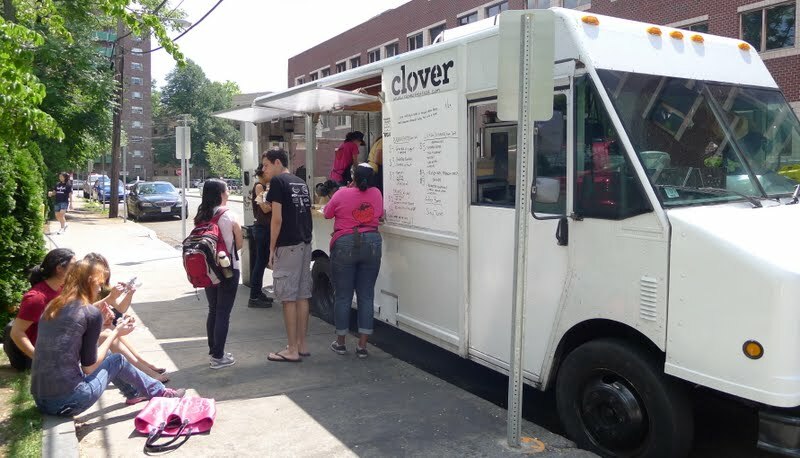 The Clover food truck has been serving hungry MIT students, professors, and visitors (including those from Paris!) since 2008 when it was originally used to run food trials for the Clover restaurant that has recently opened in Harvard Square. 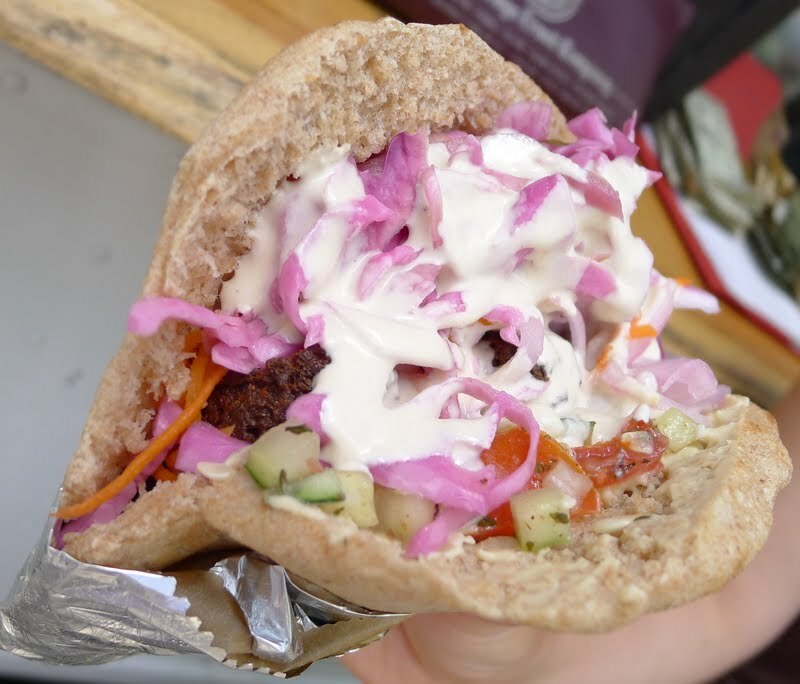 If you're in Cambridge, be sure to stop by and ask for the Parisian falafal! They're open weekdays, even during the bitterly cold winters, from 8:00 am until 7:00 pm. And if you're not in Cambridge, there are Clover food trucks parked at various locations throughout Boston. Take a look at the Clover Fast Food website to learn more. L'As du Falafal in Paris. Normally it has a LONG line in front of it. I'm glad you found the Clover truck! They are my favorite option for a quick and delicious meal at lunch time. Next time you really have to try the falafal - the fries are great, but sometimes they can be a bit too salty. If you want a good asian food option, the Gooseberry truck is also really popular and has a wide range of cheap thai dishes. The food trucks near the Hayward lot are delicious and definitely the best value lunches in Cambridge! I also love the soups and the egg and eggplant sandwich from Clover. In the winter they occasionally give out free hot apple cider to drink as you wait for you food when business is slow. It's really interesting that their falafal is Paris-inspired. I'll have to try the original next time I'm in France! Hi - I'm new to your blog but liking the Boston/Paris connection. I went to school in Massachusetts and have many fond memories searching out good cheap eats in Boston. Also I can certainly attest to the overstuffed goodness of the l'As du Falafal falafel. It's not far from my house and is definitely worth the wait in the fast moving line! Enjoy your vacation! Sara, I'm really happy that I found the Clover truck, too! :-) Thanks for the tip about Gooseberry, but I think that I really have to try one of those falafals before I move on to Thai food! Rene, What a great idea to serve hot apple cider in the winter. They don't do that it Paris. It seems as if the egg & eggplant sandwich is one of their best sellers. I saw another customer eating one and it looked delicious! Theaccidentalparisienne, Welcome! You're lucky to live so close to l'As de Falafal. It's a trek across town for me, but one that I never mind making. My kids, who are students in Boston, have been introducing me to some of their favorite spots. It's a great place for cheap eats, especially ethnic food. What was your favorite spot when you were a student? I just read quite a few of your blog posts and will have to read more to discover why you're an "accidental" Parisian.